About Christina Ricci – CHRISTINA RICCI MORE PARS! Christina Ricci is LPGA Class A, TPI Golf Level 3 & Power Level 2 Certified and a Best-Selling Golf Author. Christina took up the game in 2000 and dropped to a 5 handicap in five short years. 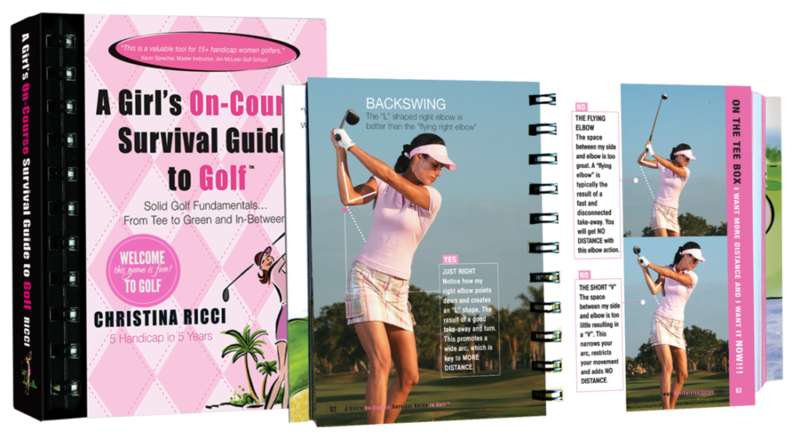 She published her first book A Girl’s On-Course Survival Guide to Golf in 2008 and never looked back. She currently has 30 plus game improvement products, hosts national golf camps, teaches locally at the beautiful Atkinson Resort & Country Club located in Atkinson New Hampshire, 45 minutes north of Boston. She’s been featured on the cover of GolfTips magazine and her popular golf tips are featured on the Golf Channel, her , More Pars YouTube Channel, national publications, and online portals such as WomensGolf.com as well as Golfforher.com and LPGA Women’s Network. Christina has established a brand that communicates the game, which began with her personal story. Her unique presentation of strong visuals, non-technical language, and a splash of humor, keeps women engaged and getting more pars. Prior to golf, Christina had her own design firm that helped small to mid-sized companies get better branding. She graduated from Boston University with a Bachelor’s degree in Business with a focus on marketing. A past president of Women in the Golf Industry, she is currently serving as the vice-president. Journey to More Pars Online Schools – perfect for corporate or group learning. Coaches and Golf Professionals: Bookmark topics for students – keeps them focused. More than 100,000 women are enjoying more pars thanks to Christina’s signature style of teaching, which includes re-creatable visuals, non-technical language, mixed with a splash of humor women enjoy. In the year 2000, my mom’s perpetual fiancé, Richard, introduced my mother and I to the game with a series of five lessons. Five years later, I was a five handicap and authoring a book about my journey. When I was learning the game, there was minimal on the bookshelf for the visual learner; lots of text heavy coffee table style books not suitable to bring to the course. So, sometimes I’d bring golf magazines or cut-outs of drills to the course, but in the 90-degree heat these flimsy pieces of paper did not hold-up well. Plus, they were too big and just got gnarled in my bag. Next, I’d write a few tips down in a note pad. That didn’t fare well either. I am a visual learner and just text didn’t resonate. At the time I didn’t know it, but there was a gap that needed to be filled! In 2008, I presented my first book and have never looked back. My Mom played a key role to which I dedicated the Pink Book. It took her a while to get on board with Richard and me, but once she did, she was clocking 120 rounds a summer! In many of those rounds, I’d help her and her friends with golf fundamentals out on the course. They improved and it made me feel really good to help them! I get asked all the time, “How the heck did you drop to a five so quickly?” The truth is, it’s no secret: hard work, commitment, practice and lots and lots of professional golf instruction. In retrospect, I would have enjoyed having the Pink, Yellow and Green book in my bag because let’s face it, most of our lesson time is spent on our long game. My background is marketing, branding and graphics. I had my own design firm in the Miami area. I had a substantial client-base, enough to support my first home and pricey luxury car. 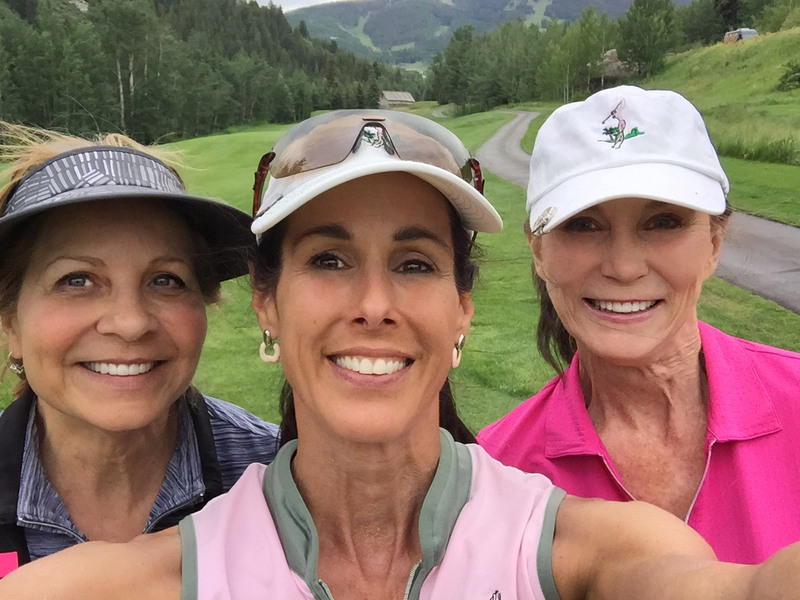 As I became enamored with the game, I found myself spending my days on the golf course, I realized after some time that my clients were beginning to notice. This was a pivotal point where I decided I needed to marry my two passions, golf and marketing. Today, I am an LPGA Class A Member and Titleist Performance Institute Golf Level 3 Performance Coach. What does that mean for your game?